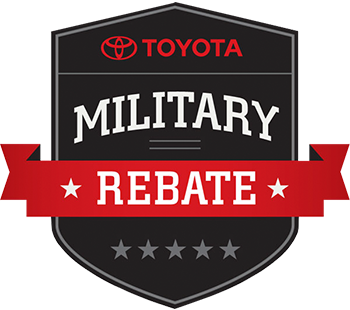 Get up to $500 Military discount on a 2018 Model Year Toyota vehicles. 1Cannot be combined, is subject to availability and may vary by region. Valid in Oregon and Washington only. Cash back savings from Toyota Motor Sales, U.S.A., Inc. and the Portland Region on new 2016 4Runner,Avalon,Avalon Hybrid,Camry,Camry Hybrid,Corolla,Highlander,Highlander Hybrid,Land Cruiser,Prius,Prius c,Prius v,RAV4,RAV4 Hybrid,Sequoia,Sienna,Tacoma,Tundra,Yaris. Washington state dealerships, a negotiable documentary service fee in an amount up to $150 may be added to vehicle price. For Oregon state dealerships, a document service fee in an amount up to $150 may be added to vehicle price. Oregon state dealerships not using an electronic vehicle registration system may only apply fees up to $115 to vehicle price. See participating dealer for details. ToyotaCare Plan is 2 years or 25K miles, whichever comes first. New vehicle cannot be part of a rental or commercial fleet, or a livery/ taxi vehicle. See dealer for plan details.